As an endurance athlete, you are constantly pushing yourself to the next level. While many of your friends and coworkers are still in bed, you are on the road or in the water working to squeeze in that extra mile or two of training in hopes of shaving even a fraction of a second off of your time on race day. Unfortunately, you may have noticed that your physically demanding lifestyle has started to affect your health. You may have also wondered why it seems so many elite athletes drop out of races from “infections.” There is a scientific reason why athletes are more susceptible to illness. Below we will explore the reasons for this and what you can do to stay healthy so you can keep on striving for greatness. Whether you are biking, swimming, or running, the harder you train, the higher your risk for infections. 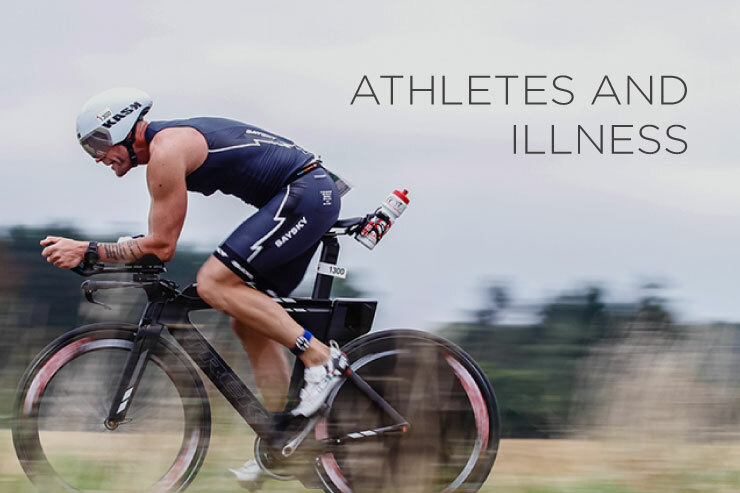 One study found that elite triathletes and cyclists have a higher incidence of upper respiratory infections (URIs), with the common cold being the most frequent. Additionally, research suggests that this increased risk for URIs may be due to a weakened immune system in athletes. Why do endurance athletes have impaired immune function? If you read our article, “What Athletes Need to Know About Leaky Gut”, you may remember that intestinal permeability increases with exercise intensity. This increased permeability may cause substances to “leak” from the gut into the bloodstream, a process called endotoxemia, and weaken your immune system. While the exact mechanism is currently being investigated, prolonged exercise has also been found to lower the levels of immune cells. Does this mean you have to choose between your health and your training? No way! Along with proper hydration, sleep, and optimal nutrition there are ways to help prevent the potential side-effects of intense training. Probiotics have been shown to boost the immune system and are a fantastic tool to add to your training repertoire. Specifically, probiotics reduce the frequency of URIs in endurance athletes and increase markers for immune system function. Are URIs not an issue for you? Probiotics have also been found to reduce exercise-induced gastrointestinal (GI) symptoms. As an endurance athlete you need to optimize every element of your training, on the road as well as off. Bottom line: stay healthy – finish strong! Katelyn Collins, is a future registered dietitian with a passion for probiotics, a knack for nutrition communications, and a love of athletic pursuits on both land and sea. Get Sound Probiotics updates and special offers. NOW GET OUTSIDE AND TRAIN! © 2018 Sound Probiotics, LLC. All Rights Reserved.